Central City in Sonic Battle. This article deals with the city as a storyline location. For more on the in-game stages, see Central City (Shadow the Hedgehog) and Central City (Sonic Battle). Central City is the capital city of the United Federation in Sonic Adventure 2, Sonic Battle and Shadow the Hedgehog. The city in Sonic Adventure 2 is unnamed, but said by many to be San Francisco or Station Square. It says in the first Hero cutscene "Above the capital city", but in Shadow the Hedgehog, in Central City, GUN soldiers say that they've cornered the Black Arms in the capital, so it's arguable that this is Central City. It has five Action Stages: City Escape, Radical Highway, Mission Street, Route 280 and Route 101. 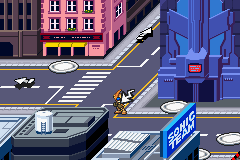 Central City appears as an overworld in Sonic Battle. In it, Amy Rose and Cream the Rabbit live in an apartment. Miles Prower goes to Central City to find out about Emerl. It has an extra explorable area called Night Babylon. Club Rouge and the Gimme Shelter are located here. Central City makes its final appearance in Shadow the Hedgehog. The first city is Westopolis, but if Shadow helps Eggman light five lanterns in Cryptic Castle, Shadow goes to Central City, which appears as Westopolis with a slight makeover. In it, GUN tries to fight off the invading Black Arms. The Hero Mission is to help Knuckles the Echidna capture twenty bombs, and the Dark Mission is to help Black Doom detonate five giant bombs. It is destroyed by the Eclipse Cannon after clearing the Dark Mission of The ARK. Whether Central City is destroyed or not is up to the player. In Expert Mode, Espio the Chameleon challenges Shadow to destroy the ruins of Central City, but one of the bombs has been moved to a construction site.